Coronary angioplasty is a procedure to open up narrowed or blocked arteries in your heart. This allows blood to flow more easily and supply your heart muscle with the oxygen it needs. Coronary angioplasty may be used to treat your symptoms if you have angina. It may also be used as an emergency treatment, and to prevent problems in the future if you have a heart attack. The coronary arteries that supply your heart with oxygen can become narrowed and blocked due to coronary heart disease. See our information on angina and heart attack to find out what can happen if your heart muscle doesn’t get enough oxygen. If you have angina or a heart attack, your doctor may recommend you have a coronary angioplasty. The procedure is carried out through a long, flexible tube (catheter). Your doctor passes this into your coronary artery from a larger blood vessel which is reached from your wrist or groin. They inflate a small balloon at the end of the tube to widen or unblock your coronary artery. They’ll usually insert a stent (a short tube of wire mesh) to keep your artery open. You’ll be awake during the procedure and you may be able to go home the same day. We give more details of what happens before, during and after the procedure below. You may hear several different names for a coronary angioplasty. It’s sometimes called a percutaneous coronary intervention (PCI), a balloon angioplasty or a percutaneous transluminal coronary angioplasty (PTCA). Our information here is just a general guide – your individual care may differ. You’ll be given the information you need beforehand by your hospital. And before your procedure, you’ll meet the doctor who’ll carry it out to discuss what’s involved. Stable angina can sometimes be controlled with medicines and by making changes to your lifestyle, such as exercising or stopping smoking. A coronary artery bypass graft (CABG) operation may be a better option for you if coronary angioplasty isn’t suitable. 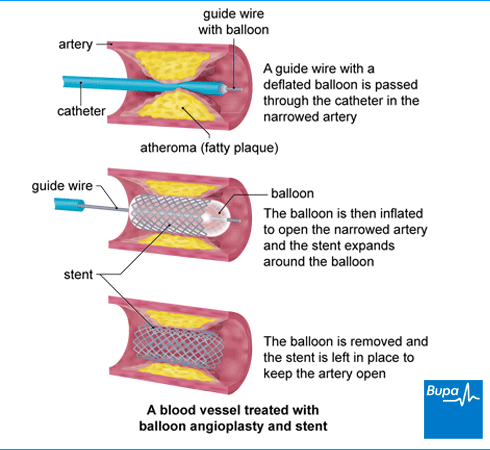 To find out more about this procedure see our information on coronary artery bypass grafting. Thrombolysis (an injection of a ‘clot-busting’ medicine) may be an alternative to emergency coronary angioplasty if you’ve had a heart attack. Your doctor will be able to explain your options and discuss what’s best for you in your particular circumstances. Your doctor or hospital will give you information about how to prepare for your procedure. If you smoke, you’ll be asked to stop. This is because if you smoke, you’ll take longer to recover and smoking also increases the risk of your artery blocking again. If you’re taking any medicines, ask your doctor if you need to stop taking them before your angioplasty. If you're having a planned coronary angioplasty, you may be able to have the procedure and go home the same day. But some people will need to stay overnight in hospital. Be aware you’ll need to arrange for someone to drive you home when you leave hospital, and preferably stay with you for 24 hours. Usually, you can’t eat or drink anything for a few hours before an angioplasty. Your hospital will tell you if you need to shave some areas of your groin before you have the procedure. Angioplasty is usually done under local anaesthesia, which will block the pain so you stay awake during the procedure. You’ll have an injection of local anaesthetic either in your groin or wrist depending on how your doctor is going to do the procedure. You may also have a sedative, which will help you to relax. Your doctor will discuss with you what will happen before, during and after your procedure, and any pain you might have. This is your opportunity to ask questions so that you understand what will be happening. You don’t have to go ahead with the procedure if you decide you don’t want it. Once you understand the procedure and if you agree to have it, your doctor will ask you to sign a consent form. You’ll probably have your angioplasty in a specially equipped room called a catheterisation laboratory (‘cath lab’ for short). Most coronary angioplasty procedures take between one and two hours. This will depend on how many narrowings need to be treated. Your doctor will give you medicines to stop your blood clotting (anticoagulants). These help reduce the risk of a blood clot forming in your artery wall or stent. After the local anaesthetic has taken effect, your doctor will make a small cut in your groin or wrist. They’ll then insert a thin flexible tube called a catheter into the artery that leads to your heart. Once the catheter is in place, your doctor will inject a special dye called contrast medium. This shows up on an X-ray, so your doctor can see the blocked areas of your blood vessels. You may feel a warm sensation when the contrast medium goes in. Next, your doctor will use X-ray images to guide a wire down the catheter to the narrowed or blocked area in your coronary artery. They’ll then insert a small balloon across this narrowing or blockage and gently inflate it. This will make your artery wider to allow blood to flow more easily. They’ll then deflate and remove the balloon, along with the wire and the catheter. Your nurse will press firmly on your wound for about 10 minutes to make sure that the artery closes and any bleeding stops. If you had the procedure through a cut in your groin, your doctor may leave the tube in for a few hours to prevent bleeding. They may then use a device to seal the hole in your artery. If you had the procedure through your wrist, your doctor may put a tight band over the artery for a couple of hours. Some stents are just metal and are called bare-metal stents. Other stents are coated with a medicine and are called drug-eluting stents. The medicine is released slowly into your artery to stop it closing up again. These stents stay in place unless they’re removed. Another type, called a bioresorbable stent, dissolves in your body over time. After a coronary angioplasty, you’ll need to rest for a while. Your nurse will check your blood pressure and pulse regularly. They’ll also check your wound for any bleeding. If you had the procedure done through a cut in your groin, you’ll need to stay in bed lying on your back for a few hours. If the procedure was done through a cut on your wrist, you’ll be able to sit up soon after the procedure. You’ll need to arrange for someone to drive you home. Ask them to stay with you for the first 24 hours after your procedure too if they can. If you’ve had a sedative, you might find that you're not so coordinated or that it's difficult to think clearly. This should pass within 24 hours. In the meantime, don't drive, drink alcohol, operate machinery or sign anything important. You may be given a date for a follow-up appointment, and details of who to contact if you have any problems. If you have any pain from the wound, you can take over-the-counter painkillers such as paracetamol or ibuprofen. Always read the patient information that comes with your medicine. If you have any questions about taking medicines, ask your pharmacist. When you get home, check your wound regularly. You may have some bruising. But if you get any swelling, or the area becomes hard to the touch or painful, contact your hospital. If your wound starts to bleed, press on it firmly and contact your hospital straightaway. See our question below on getting chest pain after a coronary angiography, and what you should do. It usually takes about a week to make a full recovery from a planned coronary angioplasty but this can vary. Follow your doctor's advice about what you can do during this time. Depending on the type of work you do, you may be able to return to work after a few days. But don’t lift anything heavy or do strenuous activities for the first week or so. See our question below about when you can drive again after having a coronary angioplasty. If you had an emergency angioplasty it may take longer to recover – ask your doctor or nurse for advice. You’ll usually be invited to attend a cardiac rehabilitation programme soon after your procedure. This will give you information on how to exercise and tips on how to get back to everyday life and keep your heart healthy. You can find out more about cardiac rehabilitation programmes from our information on heart attack. You’ll probably need to take medicines to help prevent your blood from clotting, for example aspirin and clopidogrel. You’ll usually need to take these for up to a year after your angioplasty. This will depend on the type of stent you have (if you have one). An angioplasty should improve the flow of blood to your heart. So, if you had angina symptoms before, these should get better. If all goes well with the procedure, you should be able to do more, and your quality of life may improve as a result. Side-effects are the unwanted but mostly temporary effects you may get after having the procedure. For the first few hours after your angioplasty, you may have some mild pain or discomfort in your chest. Tell your doctor or nurse if this happens. You may have some pain or bruising where the catheter was inserted. This is common, and doesn’t need any special treatment. If you have any redness, swelling or lots of bruising when you get home, contact the hospital. Complications are when problems occur during or after the procedure. Possible complications of an angioplasty are listed below. Bleeding from your wound. A collection of blood (haematoma) may form and you may need to have a small operation to repair your artery. Your artery becoming narrow again (called restenosis). This is more likely to happen in the first six months after the procedure. If this happens, you may need to have another angioplasty. A blockage within the stent, which stops blood flowing to your heart muscle. This may happen during the procedure, or at any time afterwards. It’s possible you may need emergency coronary artery bypass surgery. An allergic reaction to the dye used during the procedure. Your doctor will treat this quickly if it happens. A stroke or heart attack, where a clot breaks off to block an artery further on. Some of these complications are very rare, and the chance of them happening will differ from person to person. Ask your doctor to explain how these risks apply to you in your particular circumstances. When can I drive again after having coronary angioplasty? When can I drive again after having coronary angioplasty? If you’ve had a coronary angioplasty, you should contact your motor insurer so that you’re aware of their recommendations. The law about driving after a coronary angioplasty is given here. Rules vary according to what type of licence you have, and how successful your treatment is. You don’t have to tell the Driver and Vehicle Licensing Agency (DVLA) that you’ve had a coronary angioplasty, but there are some restrictions on your driving. If you’re not sure, check with your doctor. If you drive large goods vehicles or passenger-carrying vehicles, you must tell the DVLA you’ve had a coronary angioplasty. You won’t be able to drive these vehicles for at least six weeks. You’ll then need to have further tests which will determine when you can go back to driving them. Is it safe to exercise after coronary angioplasty? Is it safe to exercise after coronary angioplasty? Yes, but it's best to take things easy for the first few days and gradually increase the amount of activity you do. Before you leave hospital you’ll be given advice about what you should or shouldn’t do. That’s your chance to ask about any specific exercise or sporting activities you want to get back to. It’s completely understandable if you feel worried about being active after your angioplasty. You might be concerned it will make your condition worse, or bring on a heart attack. But your heart is a muscle so it needs exercise to keep it fit. It's really important for the long-term health of your heart that you stay active. Walking is a great way to start getting exercise and you can build up the distance you walk as the days go by. After a few weeks, you might want to try riding a bike or going for a gentle jog. You may be offered a cardiac rehabilitation course after your angioplasty – this will give you advice about exercise. If you become breathless or have any chest pain when you exercise, stop and rest and contact your GP. How can I reduce my risk of heart problems after coronary angioplasty? How can I reduce my risk of heart problems after coronary angioplasty? A coronary angioplasty opens up your arteries and improves the flow of blood to your heart muscle. This aims to improve your symptoms but isn't a cure for heart disease. The good news is that there are lots of things you can do to help keep your heart and your blood vessels healthy in future. These include living a healthy lifestyle and taking any medicines your doctor recommends. You may find it helpful to read our information on coronary heart disease, and high cholesterol. We also have many health blogs with useful tips and hints for a healthy lifestyle, including giving up smoking, tips to prevent heart disease and cutting back on alcohol. Will I still get angina after a coronary angioplasty? Will I still get angina after a coronary angioplasty? For most people, angioplasty will improve the blood flow through the artery that’s been treated. But it’s possible that your arteries will get blocked again so your angina symptoms may come back after the procedure. If you have a bout of angina, the British Heart Foundation advice is to follow the steps listed below. If you have glyceryl trinitrate (GTN) spray or tablets, take this as your doctor or nurse has told you to. The pain should ease within a few minutes. If it doesn't, take your GTN again. If the pain doesn't ease within about five minutes of taking the GTN a second time, call 999 immediately. If you're not allergic to aspirin and have some on you, chew an adult aspirin tablet (300mg). If you don't have an aspirin on you or are allergic to it, just stay resting until the ambulance arrives.